All Locomotivation learners can apply for an NUS Apprentice Extra Card, which can offer substantial discounts on a wide range of products and services. 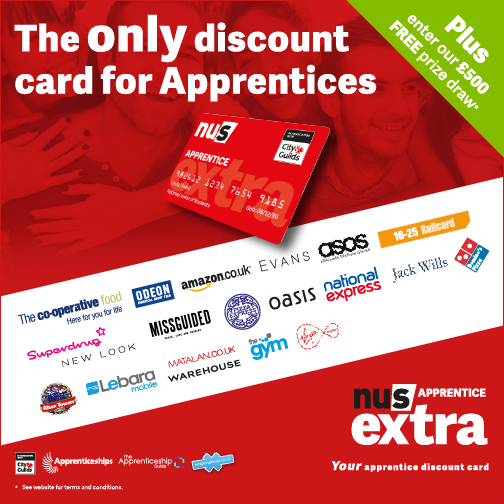 The NUS Apprentice extra discount card has been developed by the National Union of Students and offers vocational learners the same discounts and benefits as other students. The NUS Apprentice extra card costs just £11 & is valid for a full 12 months. Buying an NUS Apprentice extra card is easy and you can do it right now. All you need is your debit/credit card and a photo then you can buy online. Choose Locomotivation Ltd as your apprentice provider from the list, en5er a few details and your card will be with you within 7 working days, ready for you to start saving. Please look at our Apprenticeship Frameworks for our funded training options.